Crew in front of control room, front from left to right: Iwa Sutisna, Agus Setiawan, Hendro Setyanto, Putra Mahasena, Taufiq Hidayat. Behind: Maman Budiman, Denny Mandey, Dhani Herdiwijaya. 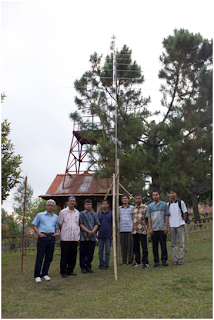 The antenna CLP 5130-1 is in the background. Maman Budiman (left) and Agus Setiawan (right) in the control room.